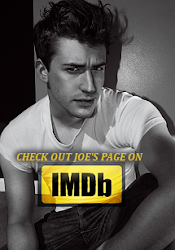 Love Joe Mazzello: What else would you like to see on this site? What else would you like to see on this site? What else should my Joe site have? Please take a minute to vote, so then I will get an idea of what else I should add. Thanks everyone! GI Joe 2 poster and wallpaper made by me. More videos added to the VIDEO page! New pictures of Joe with the GI Joe 2 cast!